I feel especially honored to be at this great institution today. However, I would be remiss if I don’t tell you a little bit about myself. I was born in the Bemba Royal family as Henry Kanyanta Sosala. I ascended to the Bemba throne as Mwinelubemba Chitimukulu Kanyanta-Manga II and I am the 38th on the throne that was established in mid-1600. According to the Zambian population census that took place in 2010, there are 73 ethnic groups in Zambia. The Bemba ethnic group is 21% of the national population and the other 72 ethnic groups put together are 79% of the population. Ichibemba is the language of communication for most Zambians (33.5%) and half of the urban population (49.5%) use Ichibemba for communication. Such is the implication-laden statistics of an ethnic group over which I have royal prerogatives. Any human society of whatever level requires organization and speaking of “organization,” I refer to the pattern of observable regularities of behavior by reference to which people are seen to order their social relationships among themselves. And this was how traditional leadership was birthed. Traditional authority refers to power that are associated with and emanate from the institution of chieftaincy. In African societies, traditional rulers derive their authority from customs and traditions that have existed since time immemorial. The chief is viewed as the ‘’symbol’’ of the chiefdom. And therefore the definition of dominion can be crafted as : To be given dominion means to be established as a sovereign, kingly, ruler, master, governor responsible for reigning over a designated territory, with the inherent authority to represent and embody as a symbol, the territory, resources and all that constitutes that chiefdom. A tribe is exclusive and the only way to win acceptance is to be born into a particular tribe. This means that the people of one tribe are not only united by common citizenship or common language, but by common bloodlines i.e., the blood of the tribe; common racial harmony and common tribal codes, most of which stretch back into pre-history. On the other hand, while the immigrant can acquire the general abstract status of Zambian citizenship which can even later be renounced, it is not possible for such an immigrant to become any of the indigenous tribes. The only way to be one of these is to be born into such a tribe. And each chiefdom was a “state” on its own under a traditional government with its own local language. The African nation-state called Zambia was created by the European colonizer for his own administrative convenience. These groupings of chiefdoms today form the immutable geopolitical boundaries and we use English as the common language. Zambia today as a nation is a federation of chiefdoms voluntarily united to meet their common economic, political, social and cultural needs and aspirations through a jointly-owned and democratically-controlled central government which is run by tribesmen and women from various chiefdoms within the territorial boundaries. Traditional rulers are custodians and repositories of traditional customs and cultural heritage. The one mark of an African traditional ruler is the moral originality which springs from his cultural foundation. And hence, customs and norms provide a means whereby modes of behavior for each society are fixed. These provide a mechanism whereby young people cannot be brought up in a higgledy-piggledy manner. And therefore traditional leadership is inherently political. This is born out of history, custom and practice because before the present mode of governments in Africa, traditional kingship was the sole government. A tribe is a political, social and economic unit; it’s like a social class in Europe in which people find their polyglot neighbors in times of distress and helpers in times of need. A tribe offered sanctuary in the old days of tribal wars. And to this effect traditional rulers used to collect tax in the form of ivory, venison or forced labor in order to meet the charge of services tribal governments could provide such as defense against enemies. Every tribe had its own indigenous form of purposeful education. And as defined in the natural and broadcast sense, education encompasses a conscious attempt to help people live in their society and to participate fully and effectively in its organization in order to ensure its continued existence. The curriculum of indigenous African education is the whole culture – the whole life of the society. Life is education and education is life, as sanctioned by society. In fact to learn in traditional societies was to become an active participant in the everyday activities of one’s community. The emphasis was on the acquisition of the common domain of knowledge. One of its greatest values, from the point of view of learning, lay in being able to bring individuals face to face with the realities of the social and physical necessities of life. The emphasis was on the acquisition of the common domain of knowledge. In short: school was society and society was school. Such an education was achieved through a variety of realistic pedagogical situations, whether the goal was to master family hereditary skills and knowledge (as in the case of herbal medicine) or that of a highly skilled trade (as in the case of blacksmithing) or perhaps that of training for leadership (usually involving young men of the royal families). In situations in which both socio-moral and techno-occupational education took place was during the period of ritual initiations, particularly pubertal initiations. One of the greatest strategic functions of every tribe is to prepare girls for womanhood and marriage. In general, all indigenous learning and training in this respect do not greatly differ from each other among the tribes of Zambia. In traditional culture, puberty is a time when a girl enters her first menstrual cycle and she is taken in confinement for a specific period to be taught on cultural aspects of a woman’s life. The main aim is character building with emphasis on the cultivation of a high degree of discipline in the girl and bedroom management skills. The majority of girls who have undergone this form of training have turned out to be good wives and mothers. Boys as well attend confinement procedures in some Zambian tribes. Culture which I sometimes like to refer to within the current African context as ‘’the effort to try to find one’s real self.’’ It has been rightly said, ‘’Anyone who has a quarrel with the past, loses the present and risks to lose the future as well.’’ It has also been said that a motorist who does not use his/her mirror to look behind will one day make a fatal accident. Life involves our growing upwards and downwards like a tree, which is able to stretch out its branches to the sky because it also sends its roots into the nourishing earth. Man or tree with no proper roots will fall. Culture operates as a balancing force within the personality. It compensates the one-sidedness of a person’s thoughts, aims and attitudes. The absence of cultural heritage tampers with the knowledge of SELF. In this scenario, what lacks is not intellect or artificial accumulated book knowledge per se, but understanding of SELF or the ability to relate to one’s whole being to the rest of the universe. This is because culture operates as a balancing force within the personality. It compensates the one-sidedness of a person’s thoughts, aims and attitudes. The absence of cultural heritage tampers with the knowledge of SELF. In fact Sham Bagley wrote: ‘’When the brain distorts the past our view of who we really are suffers.’’ (Newsweek 16th July 2001). St. Augustine in De Ordine wrote: ‘’Self-knowledge is the result of inner unity.’’ He compared human nature to a circle. Unity for him means ‘’to be at the center,’’ from which every part of circumference is equidistant. The farther from the center one wanders towards the circumference, the less united and, therefore, the poorer one becomes. The Law of Generation states: ‘’We are all linked to previous generations behind us. Our ancestors are in our genes, in our bones, in our marrow, in our physiological and emotional make-up. We, in turn, will be written into the children who come after us.’’ There is a seemingly instinctive pull of one’s heritage, our inborn curiosity in our origins, the quest we all share for self-identification and self-knowledge. The BBC Focus on Africa magazine of July-September, 2009 in an article titled ‘’Black America Back to its Roots,’’ reported that many prominent African Americans are finding their way “home.” In 2005, the popular American talk-show host, Miss Oprah Winfrey underwent some deoxyribonucleic acid (DNA) testing, since she wanted to know where her ancestors who were taken as slaves to the USA had come from. “I am Zulu,” Winfrey declared in Johannesburg. The immutable truth is that cultural heritage cannot be magicked away in the twinkle of an eye or eliminated with a snap of one’s fingers. It will live for many a day and be a continual source of weariness and frustration. It is something that can be blocked and thwarted, but cannot be got rid off. Even the western aristocratic education can never drown cultural heritage, because while logic can convince one’s reasoning, it cannot, however, overcome the inertia of dualistic thinking. Intellect may comprehend the oneness of things, but thinking will still continue in dualism. Booker T. Washington (1856- 1915), the first national spokesman for the Black Americans wrote: ‘’….notwithstanding the cruelty and moral wrong of slavery, the millions of Negroes inhabiting this country, who themselves or whose ancestors went through the school of American slavery, are in a stronger and more hopeful conditions, materially, intellectually, morally and religiously, than is true of an equal number of Black people in any other portion of the globe.’’ (From Up From Slavery autobiography 1901). Cultural incompatibility which somehow depicts the Law of Reversed Effort is one of the major obstacles that has greatly contributed to Africa’s underdevelopment and it is unfortunate that even those involved in national development have fallen prey to the theory that treats Africa as homogeneous entity with similar conditions to the rest of the world. And therefore any development programme must take into account the real and latent possibilities of traditional circles for carrying out the tasks laid before the people. Western Democracy in the entire Africa has failed since there is the problem of sum-zero politics in which the winning political party takes all. The notion opposite to democracy is not dictatorship but oligarchy. African politicians and parties are only more interested to capture power. In other words, the party is the supreme, political organization in modern Africa and the legislative body appears in many cases to be more than unnecessary intermediary. And as R. Michels wrote in Political Parties: ‘’The party, regarded as an entity, as a piece of mechanism is not necessarily identifiable with the totality of its members….. the oligarchical structure of the building suffocates the basic democratic principles.’’ And therefore the so-called ‘’democracy’’ has taken a highly telescoped form and it has moved from a constructive to a destructive phase with undue haste and in this case there is always no hope for a gentlemanly confrontation between various political parties. Reverend Simon Muwowo in his Thesis: Multipartism and the Matrilineal Governance System of the Bemba-Speaking People of Zambia: An African Theological Perspective, wrote: ‘’Africa in general is caught up in a web of practicing systems that are unfounded within the ethos and governance of our traditional societies. ‘’Some government systems which Africa has copied gullibly from foreign nations may deserve overhauling in order to find their legitimacy or discard them all together’’ (Chuba, 2011). It has been proved in Zambia and in other African countries, elsewhere that it is no longer healthy and even ‘’dangerous to adopt them randomly in a belief that all African traditional forms of government are completely unsuitable or barbaric’’ (Chuba, 2011). Our search for an African identity in political governance, should depend on the foundation of Africans and dispel the ‘’notion that only government systems from overseas are viable for Africa’’ (Chuba, 2011). ‘’The governance system of the Bemba speaking people is one such example with an effective system which when harnessed is another landmark contribution to the world. The Ashanti and the Akan tribes of Ghana as well as the Lozi of Western Zambia among others in Africa have in the history of Africa recorded magnificent traditional systems of governance, which when put together could provide an agenda for an authentic African political identity. ‘’The chieftaincy model of democratic governance, presupposes that representatives of chiefdoms are recognized as legitimate participants in the governance of the state along side the elected political parties. The concept was practiced in ‘’Botswana’’ (Nyamnjoh, 2003), ‘’Mozambique’’ (Harrison, 2002) and ‘’South Africa’’ (Oomen, 2000). In other words, it is the ‘’practice of primordial chiefs playing an active role in the administration of the government at the national and local levels’’ (Bradley, 2005). In short, as a matter of recognition of traditional authority by ‘’post-colonial governments of Botswana and South Africa’’ they embraced chiefs as ‘’functioning […] administrative’’ (Bradley, 2005) extension officers in order to foster development from the grass-roots and enhance participation of all citizens in the general administration of national affairs through their own representatives. ‘’The idea here was not a matter of political interest as such but was based on perception that since chiefs were natural leaders of the people in an African society whose mandate emanated from the people who installed them, it was inevitable to grant them rights of representation in government. Further, they were viewed as ‘’legitimate power brokers, representatives of clans, and genuine voices of their respective local communities’’ (Harrison,2002). In this regard, one can say that chieftaincy representation as a model ‘’vividly represents another version of democracy contrary to western democratic notions’’ (Bradley, 2005). ‘’In Zambia during the British Colonial rule, ‘chiefdoms were run on semi-autonomous basis as today’s local governments’ (Sosala, 2014). They worked on the concept of indirect rule as a way of ensuring development reached the people without their intervention. After years of struggle they discovered that there was need to come up with an approach to governance that was purely going to be embraced and therefore enhance participation. When an indirect rule was implemented, the main objective of it was ‘the recognition of the Native Authorities to help Africans enhance their own traditional institutions in governance’ (Sosala, 2014). The idea here was that during the time of colonization, the colonial masters found functional institutions which were very effective in the dissemination of development to all the people. And having noticed the effectiveness of the system, the British colonialists had to effect strategies on how they would effectively run a government that would produce results. As such ‘in 1936, the new policy of indirect rule found expression in a series of important ordinances such as Native Courts ordinance and Native Authority ordinance’ (Sosala, 2014). The ordinances mentioned had a special mandate to accomplish. They were centered on the policy of devolution of power to the grass-roots where the central colonial government was unable to reach in order to fulfill the development demands of the people. The colonial set-up failed to raise funds from the natives because their model was centered on tax collection and the majority of the people were not in employment. It was in this regard that they introduced another ordinance which ‘permitted Native Treasuries to be set up’ (Sosala, 2014). The Native Authorities through their protocol of the participation of all citizens could raise some funds using various means but predominately they were raised through ’court fees and fines, bicycle, dogs, fire arms and game lincences’ (Sosala, 2014). It was at this point that the government agreed to pay to the various treasuries 10 percent of native (or poll tax) collected either inside or outside the district from Africans belonging to the tribe’ (Sosala, 2014). ‘’We can deduce that the fact that the recognition of the effectiveness of the Native Authorities’ ability to deliver in the case of Botswana, Zambia, Mozambique and South Africa means that the democratic values of the African people on this basis can be guaranteed and therefore a legitimate model upon which to base in the formulation of an authentic framework for Non-party democracy by consensus. It awes to this fact that as model of democratic governance, the diffusion of power to involve chiefdoms ‘’are viable alternatives to democratic governance’’ (Bradley, 2005) and on this foundation one can look to them as plausible foundation upon which to build a Zambian-African polity. ‘’Much as the party or multiparty system of government may record a success in the western countries, the ideologies that embrace it perpetrate a power struggle to a point of risking people’s lives. Political parties in Zambia, for example, are ‘personal to holder and the fundamental weakness in this state of democracy is the question of the removal of the founding leader of a political party’ (Sosala, 2014). Yes the trend is so powerful to an extent of disregarding other people who would even do better. Sosala laments the failure of democracy and alludes to the fact that the failure is as a result of adopting a foreign model of governance other than developing an indigenous one that could simply be polished and produce and acceptable entity of good governance. He states, ‘We hoped to see our country become a nation based on parliamentary constitutions or the Westminster model and enjoying responsible democratic government, but unfortunately we are at the tail-end of history, after fifty years of self-rule, having even gone through the so-called one party participatory democracy and it is now very clear that Westminster model as a model for Zambian democracy has absolutely and totally failed’ (Sosala, 2014). This particular voice from Mr. Sosala, the Paramount Chief of the Bemba people points us to re-evaluate the political system and to a higher extent make an authentic alternative system of governance for Zambia. ‘’Henry Kanyanta Sosala in his article, The Descent of the Bemba, observes that in an African political system, ‘there is a conviction that the embodiment of knowledge, intellect and wisdom including mega-talents and multi-gifts are all confined within the inner circle of the political party in power and never elsewhere. And any criticism from outside the party system, no matter how wise or reasonable is only considered to be deliberate and calculated malicious attempts to throw the infallibility of the ruling party in doubt ’ (Sosala, 2014). And as such it makes it very difficult to embrace democracy in the same way it operates in the West to an extent that politics are reduced ‘to a level of football match. A football match may of course attract some very good players. It may also be entertaining, but it is still only a game and only the most ardent fans [who are not usually the most intelligent] take the game seriously.’ (Rohio, 1975). Man makes himself and it is his ability to act deliberately for self-determined purposes which distinguishes him from other animals. For example, a mother does not ‘’give’’ walking or talking to her child; walking and talking are not things which she ‘’has’’ and of which she ‘’gives’’ a portion to the child. Rather, the mother helps the child to develop its own potential ability to walk and talk. Hence, man’s development centers on self-reliance. Man certainly cannot be developed by others. Man’s consciousness is developed in the process of doing things because development has a purpose of liberation of man and the whole process is intensely personal in the sense that it has to be a personal experience; no one can have his consciousness developed by proxy. And as a traditional ruler, part of my job is to survey the social and economic trends; to try and understand and help the peasants in their practical personal problems of living out their lives; to try to open a way of constructive understanding and to help them improve the judgment of the people about the priorities etc. and this has given me an opportunity to gain an insight into the lives of the rural communities much more than the casual and emotional observer who might quickly be over-carried by the apparent external poverty and judge the un-sophiscated rural communities as formidable masses of confusion and social chaos and the people better off dead than alive. But the reality on the ground is quite the opposite. The extended family system or ’’the sharing of poverty’’ helps to maintain an internal equilibrium in spite of external poverty. It constitutes a social security scheme which has the advantage of following the natural pattern of personal relationships. It also provides for richness in the knowledge and experience for those fortunate enough to be part of it. Whattt??? To be continued from that long book? It will take me a week that letter to pagans. What happened to Bemba romantic stories? At least today i have read the News which is educative and worth knowing. Not all these of Political mischievous all the time. This is what you can call a Chief. Not those that crap their pants during bungee jumping. The 23% this chief commands determines who goes in to state house. Not Mr crappy pants Mukuni. Why quote white authors to authenticate an African kingdom? Was it an address or a paper on African Chiefs? It could have been more important to dwell on the role of women in determining the Chief than focus on his own importance. Why quote colonialists when addressing African-Americans as though their views are what gives legitimacy to the throne? ….And what’s behind quoting those language statistics? ; when it goes without saying that not all so-called “Chibemba” speakers are ethnically Bemba. Very cheap, primitive loyalty. Yes, I too I am disappointed that my chief has quoted only Kaunda and Muwowo. Where are our rich African proverbs. The essay runs like is being presented by a professor from USA, not a chief who comes from a tribe with such a rich history. I miss Abena Valentine Musakanya who died before he finished his book on Bemba history. The students must have been bored to death, as I was as I read this article. 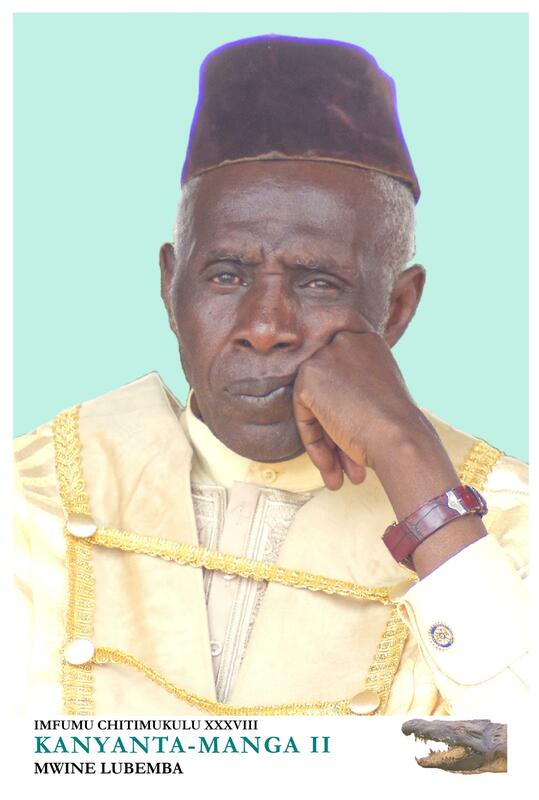 That’s my paramount Chief Kanyanta Manga Sosala. My Chitimukulu. A fountain of knowledge. This a is a lecture and I appreciate it your highness. kindly leave chief mukunya out of this, after all he is the richest chief in the land though the poorest knowledgewise. just like his small god hh. Kanyanta Manga II at it again…. Thanks to his royal Highness the CHITIMUKULU for a great read. I anxiously await part 2. “… The one mark of an African traditional ruler is the moral originality which springs from his cultural foundation. And hence, customs and norms provide a means whereby modes of behavior for each society are fixed…” – Mwinelubemba Chitimukulu Kanyanta-Mwanga II. This is very educative and informative and should offer terms of reference to those among us who seek objective truth, and hence provide a means whereby modes of behaviour are fixed. I am aware that ichibemba, like many other Zambian languages, has a lot of rich and character-building idioms. But some of them have slowly but surely been deformed by Townisation of Bemba. Cont’d ….. distorted to:- “Imiti i kula eyo bochako amalasha” (Geminating trees are best for charcoal burning and production). Therefore, it is with this in mind that I seek your clarification as mwinelubemba on the following Bemba idiom because my town Bemba is not equal to the task. “Uubomba mwibala aya mwibala” What is the ORIGINAL correct interpretation? I want the truth, the whole truth and nothing but the truth. I owe it to my children to be truthful in the original sense, and help them have a high self-esteem w.r.t. their Zambian roots. “Uubomba mwibala alya mwibala, lelo tekulya nembuto awe” ?